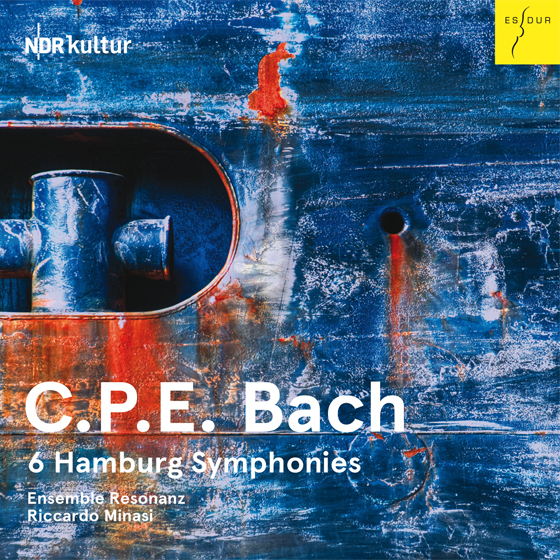 Carl Philipp Emanuel Bach’s 6 Hamburg Symphonies have become quite popular since the 1960s and the number of recordings has increased steadily, making this set of early Classical symphonies something of a trendsetter. Like much of C.P.E. Bach’s music, these symphonies were innovative and full of variety, especially in the dramatic shifts of mood typical of the Empfindsamer Stil (sensitive style), so the music is always surprising and full of energy. Riccardo Minasi’s performances with Ensemble Resonanz are almost equally surprising, because the group plays modern instruments but sounds remarkably like a period ensemble by using techniques appropriate to the era. More importantly, Minasi strives for faithfulness to the intentions behind the score, rather than to arbitrary ideas of authentic performance practice, so the player’s warmth, vigor, and spontaneity are quite appealing, and far more musical than a technically accurate but drily academic reading might be. Enhancing the freshness of these renditions is the startlingly immaculate recording, which highlights every line and gives every part presence and crisp clarity. While the modern instrumentation may trouble purists, the ensemble’s vibrant spirit is undeniable and Minasi’s intense direction gives this music the fire and unpredictability it needs.